Your teeth play a decisive role in your health, well-being and physical appearance. Are you giving them the protection from damage they deserve? Teeth are remarkably durable and strong but carelessness, mistreatment or accidents can have serious, often painful and physically unattractive consequences — which New Jersey Top Prosthodontist, Dr. James Courey, treats every day. • Don"t bite down on hard food, like bones or stale bread. And beware of rock-solid bagels and hard candies. Ice cubes and popcorn kernels can also cause damage. • While red wine, tobacco, coffee and can stain your teeth, cosmetic dentistry can make them "smiling white and bright" again. Smoking is also a major cause of tooth discoloration — and smokers are more likely than non-smokers to have gum disease. • Remember that teeth are for eating, not for chewing on pencils, prying open packages or lifting off bottle caps. • Always wear seatbelts in cars – and in taxis. • Clenching and grinding over time can eventually cause cracks in teeth. Speak to your dentist about solutions. 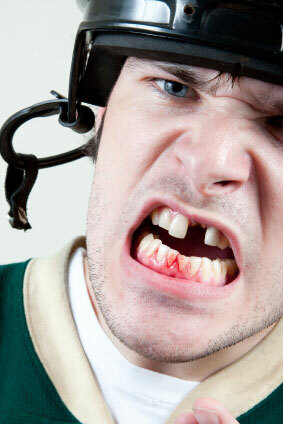 • Tooth trauma is a constant danger during contact sports and many recreational activities. The very real potential for tooth injury is almost always present, from basketball, racquet ball, roller and ice skating to volleyball, football, baseball, rollerblading and bicycling. Mouthguards offer much-needed protection during all these activities. You might even consider them seatbelts for your teeth. According to the American Dental Association, an athlete is 60 times more likely to suffer harm to the teeth when not wearing a mouthguard. -Five million teeth are accidentally knocked out in the U.S. each year and most people do not know what to do in such an emergency. If your teeth are injured, discuss the treatments available to restore their function and appearance with a specialist like Manalpan Prosthodontist, Dr. James Courey. Call 732-298-6551 to schedule an appointment.